Forest tourism cat eyes it is the only place where tourism is undeniably the woods, for those of you who like to roam the woods is a good idea to visit here. Location of tourist jungle cat's eyes are the highway edge of Bukit tiban Sekupang Batam. 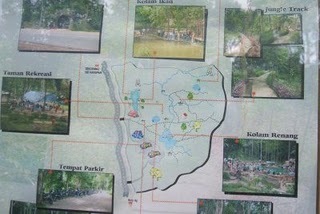 To reach kelokasi jungle tours can cat eyes from various parts of the city of Batam, if you are from Nagoya you can drive a taxi or motor-Sekupang tiban direction and may also from mukakuning toward the stone continues to rotate in the direction aji Sekupang, you simply select depends on where the position your journey. On the way to jungle tours eyes of your cat enjoy the natural scenery city of Batam, this tourist attraction is very quiet as the name suggests, however there is a swimming pool inside the children and adults, mini-garden animals in it there are different kinds of animals such as orang-utan, monkey , snakes, eagles, etc.. Besides, here there is also a fish pond for anyone happy with the fish. Forest Cat's Eye-pavilion pavilion provides small and medium for those of you who want to sit back to enjoy the fresh air in this forest. If you want to ride to the top of the forest could also, there is terrain that is normally used for propaganda or camping tours. Whether you've never enjoyed eating in the woods? in the eyes of a cat jungle tours available restaurants or you can bring rice from the outside or from your home. Sensation of eating is very different from the middle of the forest to eat at a restaurant in the center of town. Tip: If you visit the Forest Tourism cat's eyes in the morning you should pake anti-mosquito lotion first, because the forest is also the name of the course will have a mosquito that will bite your body, or use long pants to avoid or take care of your body from mosquitoes and grass -grass are nearby.